If you struggle with finding ideas of using digital signage in your locations or with finding original ways to engage your viewers, here are a few videos that might help. In their efforts to attract consumers’ attention, brands have turned the digital outdoor advertising environment into a playground. Send a SMS, touch a screen, take a photo, scan a code and let the game begin! 1) Our first pick is MacDonald’s interactive billboard which entices you to take a photo of a product (coffee, sundae, burger etc. )- if you can- things are popping in and out quite fast- then show it at the nearest MacDonald’s restaurant. You don’t need a billboard for that, a screen in a restaurant, fish & chip shop or a canteen could be easily used to launch a game or competition as such. I’m not sure if those playing will be gaining anything if they perform well (”crush” as many eggs as they can) but it’s an interesting way of making the ad fun and unintrusive (and of course memorable). This is the only one not digital, yet the idea is worth mentioning. Send a text to a number displayed on the billboard and see what happens- (quite a lot of) smoke will come out of the advertised Honda car. The ad’s value proposition (besides the product itself)? Entertainment. Prompt your audience (customers, visitors, students etc.) to trigger a certain message on the screen (information they’re interested in, a video etc). It doesn’t have to be complicated, it just needs to be relevant. To promote the Swedish reality show, billboards equipped with moving detectors and speakers were installed on Stockholm’s streets. Every time someone was approaching the screens Japanese people applauding and cheering were shown on the screens. Arguably not the best, yet definitely original the content constituted an interesting way of attracting people’s attention and entice their curiosity. On a more sophisticated note and taking relevancy of content to a new limit, Vanquish offers its customers a dynamic presentation of its products at the touch of a hanger. Screens of different dimensions (shelf-edge and wall mounted) show how the clothes would look like worn, sparing viewers of the task of trying them on (read more here). In-store technology that stays true to its purpose- delivering the right information, about the right products, right now. The future of advertising is reaching consumers all day, with relevant, targeted messages. Today’s new technologies give way to new location- based services, an integral part of the on-site marketing mix, making the path to purchase more informative and social (Garry Mcguire, DigitalOOHbiz). 2 of out of 5 examples involved some sort of interaction with the screen which signals the fact that the gap between digital screens and smartphones is being gradually bridged. We have the technology in place (see Screenreach and Locamoda) to offer viewers the chance to respond in real-time to what they see on the screen. 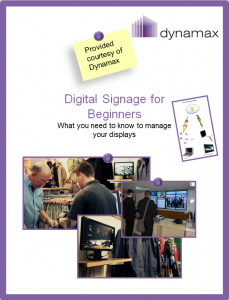 To find out more about the potential of digital signage to start a two way communication, download our whitepaper- Digital Signage for Beginners. More digital signage content tips can be found here. Any interesting projects we’ve missed? Mention them below. This entry was posted in Marketing and Advertising and tagged advertising by Dynamax. Bookmark the permalink.